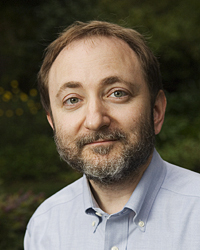 Andrew Zachary Fire (born April 27, 1959 in Palo Alto, California) is an American biologist. He is a professor of pathology and genetics at Stanford University School of Medicine. Fire was given the 2006 Nobel Prize in Physiology or Medicine for the discovery of RNA interference. The research was conducted at Carnegie Institution for Science and published in 1998. Fire completed high school at age 15. He wanted to study at Stanford University, where he would later work, but was not accepted. He studied at the University of Californiaat Berkeley. Fire graduated with a bachelor's degree in mathematics at 19, and earned a PhD from the Massachusetts Institute of Technology (MIT) in 1983. In 2006, Fire and Craig Mello shared the Nobel Prize in Physiology or Medicine for work first published in 1998 in the journal Nature. The paper reports that tiny snippets of double-stranded RNA (dsRNA) effectively shut down specific genes, and so caused the destruction of messenger RNA (mRNA) with sequences matching the dsRNA. As a result, the mRNA cannot be translated into protein. ↑ "MIT alum shares Nobel Prize in physiology". web.mit.edu. October 2, 2006. Retrieved March 29, 2011. This page was last changed on 30 August 2017, at 20:44.